The workshop is jointly organized by the WCRP Working Group on Coupled Modelling (WGCM) CMIP Panel and the European Commission Horizon 2020 projects PRIMAVERA (PRocess-based climate sIMulation: AdVances in high-resolution modelling and European climate Risk Assessment) and EUCP (EUropean Climate Prediction system). 1. How does the Earth system respond to forcing? 2. What are the origins and consequences of systematic model biases? 3. How can we assess future climate change given climate variability, predictability, and uncertainty in scenarios? The workshop will consist of a series of seven half-day sessions of three hours each. Each session will begin with 20-25 presenters given a 3-minute time slot to show no more than one slide summarizing the main conclusions of their poster. The rest of the half-day session will consist of viewing posters of that session. In addition, there will be a plenary talk each day. Participation is limited by the size of the venue (~200 people) and format of the workshop. Abstracts will be accepted based on relevance to the workshop focus. 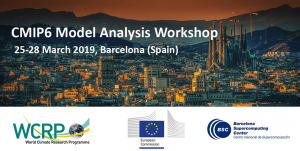 More information on the workshop will be made available at https://www.wcrp-climate.org/modelling-wgcm-meetings. Hope to see you in Barcelona next year! Please remember to send us a quick email with your feedback to gro.e1555870198tamil1555870198c-cra1555870198ps@ec1555870198iffo 1555870198. Thanks!